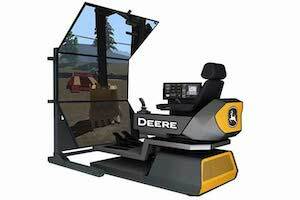 John Deere announced it will be rolling out new construction simulators, helping workers gain a better understanding of their equipment. To learn more, contact your local John Deere dealer. John Deere has announced that its 644K and 944K Hybrid Wheel Loaders have collectively logged over 1 million operating hours. Learn more by contacting your local John Deere dealer or visiting www.Deere.com. John Deere is expanding its Worksite Pro™ line of attachments with new angle and pickup brooms designed with cleanup in mind. To learn more, visit your local John Deere dealer or www.JohnDeere.com. John Deere announced that it is introducing two new models to its L-Series lineup: the 244L and 324L compact wheel loaders. To learn more about any of the L-series compact wheel loaders, visit your local John Deere dealer or www.JohnDeere.com. Following the destruction left behind by Hurricane Michael, John Deere teamed up with Beard Equipment to donate the use of a construction equipment to impacted areas. Learn more at www.JohnDeere.com. John Deere has expanded its line of job site cleanup solutions with new grapple buckets. For more info, visit www.JohnDeere.com or contact your local dealer. In an effort to cater to customers working on job sites that involve leveling and slope work, John Deere has announced a new on-board grade indication option for its machines. Learn more about this feature at www.JohnDeere.com. John Deere is set to participate in the 2018 GIE+EXPO in Louisville, KY which runs from Wednesday, October 17 to Friday, October 19. For more information on this event, visit https://www.gie-expo.com. John Deere has announced that it is adding to its Worksite Pro attachments lineup with the addition of the new SS30 model Stump Shredder. To learn more about the SS30 and all of its features, speak to your local John Deere dealer or visit http://www.johndeere.com. John Deere has introduced the new 344L Compact Loader, designed to move material quickly and make tight turns, to its equipment lineup. Adding to its G-Series compact equipment lineup, John Deere has announced medium-sized skid steers and a new compact track loader. John Deere has announced the addition of grade guidance technology to its 210G LC excavator, as well as other updates to LC excavator models. John Deere has announced the addition of SmartGrade™ Technology to its 950K Power-Angle-Tilt crawler dozer, which will allow for reduction in time for setup and recalibration. For more information, contact your local John Deere dealer or visit www.JohnDeere.com. John Deere has announced that the John Deere 310E received the GOOD DESIGN® Award from the Chicago Athenaeum Museum of Architecture and Design.